Diary of a Decorator takes place in the years after the Second World War, where Colin Douglas-Fairhurst turned the modest decorating business founded by his father into a national leader in the field. FWA, as it became known, won contracts to repaint many of Britain’s most prominent buildings, from Buckingham Palace to Waterloo Station and from Blackfriars Bridge to New Scotland Yard. Along the way Colin raised a family, saw the world, owned and drove more than 70 cars and had a great deal of fun amid all the hard work. 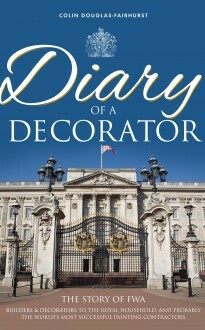 Diary of a Decorator is the story of his life, his family and his business.